April's Little Family: All By Himself! He can hold the pole and reel the fish in all by himself now! Awwwww, my big guy! Aww, he is just too cute! 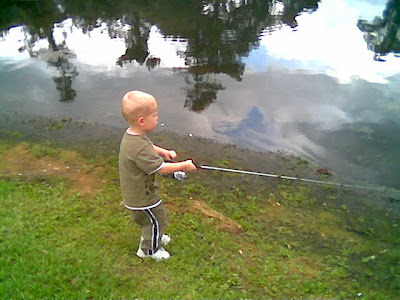 How cute....he is really getting into his fishing! He does better than me! Wow. Now that's a fisherman! His great grandpa would have loved to have known him. He loved to fish more than anything.